Sherlin’s own brand of Thermal sock are amazingly durable thermal socks which are designed to withstand the stresses of demanding use yet are exceedingly comfortable to wear. These hard-wearing work socks are suitable for all boots- whether it be farming, tramping, skiing or general use. You'll be amazed at how well they last! They are made up of 60% Alpaca, 20% wool and 20% Nylon with the Alpaca fleece being sourced from Sherlin’s own Alpacas. Fibre yarn and socks are manufactured in the South Island of New Zealand. The thermal sock can be machine washed (cold water). Give them a slight stretch while wet then hang on the line. PLEASE DO NOT TUMBLE DRY. 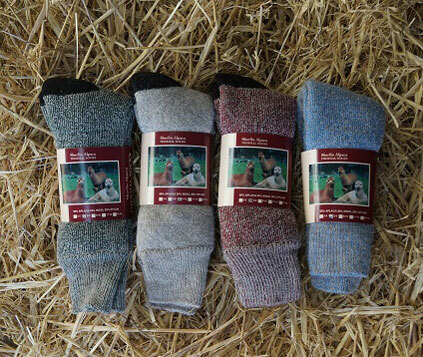 Sherlin Alpaca Thermal Socks come in 4 colours: natural, green weave, blue weave and red weave and steel. Steel is currently only available in sizes 6-8, 9-10 and 11-12. Please note colours may be subject to change.